As usual between downtime at work this week I was doing some exploring on pinterest travel and I found this image. The caption only said "Dry Tortugas!" and the link was dead (sometimes I hate pinterest) so I searched deeper and considering I am born and raised in Miami, Florida I felt so incredibly dumb when I found out its located right off the coast of Key West, and is actually apart of the National Park system. So today my #wanderlustwednesday post is dedicated to Dry Tortugas National Park. It has a pretty interesting history as well. Ponce de Leon discovered it in 1513. It was named Dry Tortugas because it lacked any fresh water (hence the dry) and Ponce de Leon caught 100s of turtles while he was here (Tortugas is turtle in Spanish.) In 1825 a light house was built to guide sea vessels and warn them of the treacherous reefs. 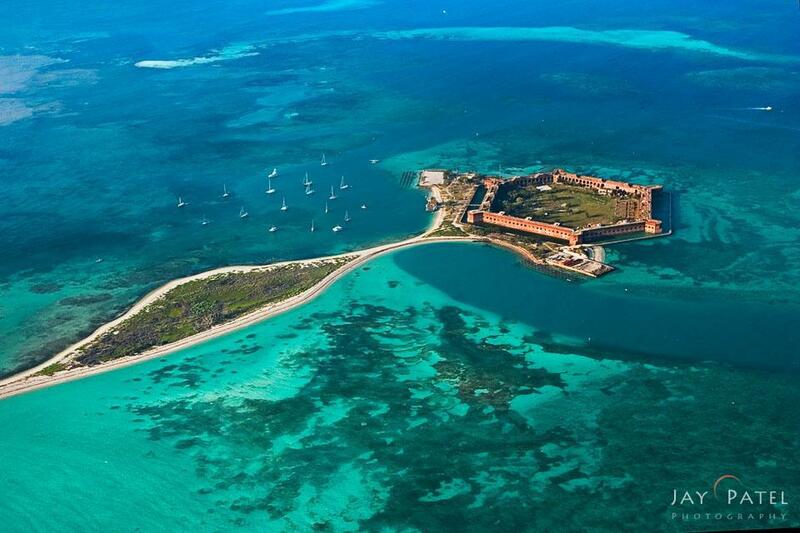 In 1846 Fort Jefferson was started - it was never completed. In 1935 Roosevelt designated it a National Monument and in 1983 it was expanded to protect the beaches and reef life along with the fort. It is located 70 miles off the coast of Key West and there are 4 ways to get to this pretty remote location. Take your own boat there (as long as you get a permit before hand). Charter your own boat (tons of options for this here). Personally I would go the camping route. It is extremely primitive camping, you have to bring everything including water with you. You can stay on the island for up to 4 days. Included in the price of the camping you get breakfast and lunch (arrival day only), snorkeling gear, guided tour of the fort. There are quite a few things to do while on the island and you can easily fill a whole day here. I can't wait to visit. **This post is apart of my #wanderlustwednesday series I do here on my blog. I have not been to this beautiful location but all information posted here is extensively researched. If you have any questions on this place feel free to email me!